they will try to prove themselves the finest combatant. are not averse to the additional edge magic can offer. by blinding or bewildering opponents. Orcs on the other hand, should never be trusted, and make deals with Goblins at your peril. These green-skinned maniacs live to fight. Even their resting state is a small squabble. 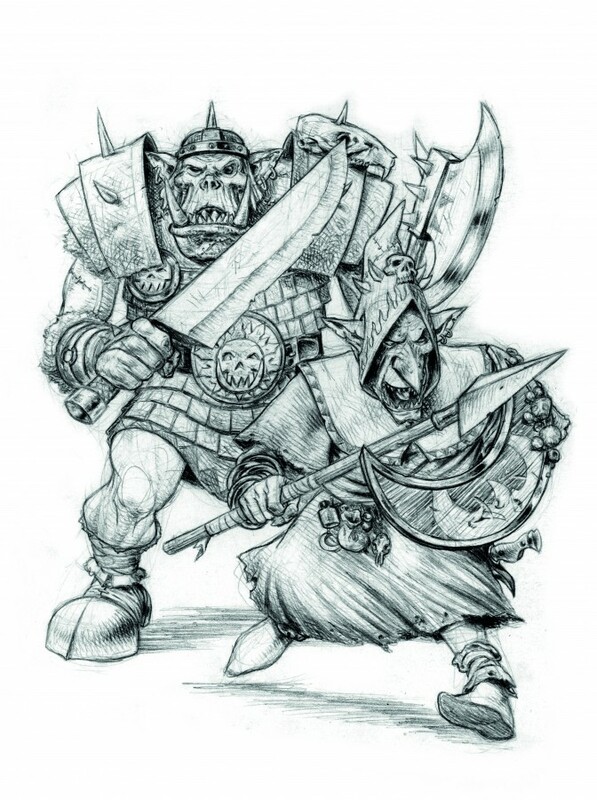 Orcs resolve every dispute with fists or blades, and if Goblins are less interested in a fair fight, they are truly resourceful in matters of murder. As varied as they are obscene, they blight civilisation everywhere. It is said that in the mists of time, before even the Golden Age, the scattered tribes were united under one great leader. Perhaps it was they who brought down the Saurians, though no record re- mains. Most disparage this tale, and I doubt even the Greenhides themselves know of its truth. Still, it is a cautionary tale. A strong warlord can command a force of thousands; a truly great one could drown the world under a green tide. Dwelling on such a thought makes one shudder.